The ViewSonic TD3240 is an ideal solution for businesses seeking the ultimate in interactive displays and digital signage. With an intuitive multi-touch display and full HD resolution, the TD3240 delivers a versatile touch solution for use in high-traffic areas such as high-end retail centers, transportation hubs, classrooms, or anywhere else that would benefit from touch applications. 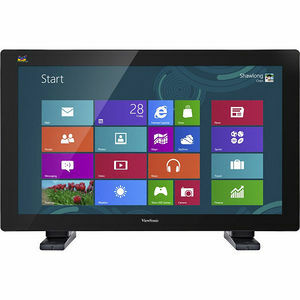 The TD3240 is Windows 8 certified and features projective capacitive 10-point multi-touch technology that provides a direct and interactive experience to attract and engage users. Equipped with 1920x1080 Full HD resolution, IPS panel technology, and a 3000:1 contrast ratio, the ViewSonic TD3240 delivers stunning color performance and image quality. As a complete multimedia package, the display also includes a pair of integrated 10W speakers with SRS premium sound. VGA, DVI and DisplayPort (via included DVI to DP adapter) inputs provide flexible and convenient connectivity, while a VESA-mountable design offers additional convenience for use as a wall-mounted interactive poster. The versatile TD3240 provides a dynamic gateway to a new world of interactivity.